Mt. Borah in the Salmon-Challis National Forest in Idaho. When we were camping in the Snake River Plain, the high snow covered mountains of Central Idaho to the north stood like a wall of awesomeness which we were dying to explore. A few roads go through the mountain ranges there, mostly following valleys or rivers. After we left Arco, ID, we followed the Big Lost River as it wound its way down the valley along Hwy 93. It is called the Big Lost River because as it exits the mountains, it actually disappears under the lava flows that covered the river’s pathway across the Snake River Plain long ago. Coming out of the mountains to the north, it gets absorbed or tunnels its way under the lava plain and emerges at Twin Falls, ID as a bunch of springs. As we started entering the mountain range, we were climbing higher and higher with huge snow covered mountains to either side of a small valley. Eventually we reached Borah Peak, which is the highest in Idaho at over 12,000ft. It is also close to the epicenter of an earthquake that struck in the 1980s which caused the valley floor to subside about 7-12ft. There was a national forest picnic area next to the fault where you could see the break in the ground and the 7 foot escarpment, which is basically the scar left by the sudden drop of the valley floor. It’s a deep crack, but it is filled by sediment so you can’t actually look down it or anything like that. The area has had no known recorded history of earthquakes, but geologists have seen evidence of past escarpments so they must have happened before. In fact, that fault that we picnicked next to was the reason that Mt Borah exists in the first place. Similar to Nevada, the crust of the Earth is being pulled apart there, so like a bunch of falling dominoes, the fault causes the valley floor to drop relative to the mountains, and the mountains to rise even higher. 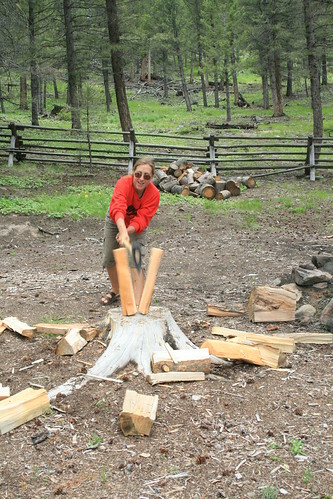 Nicole splitting wood for our campfire at the Peel Tree A-Frame. 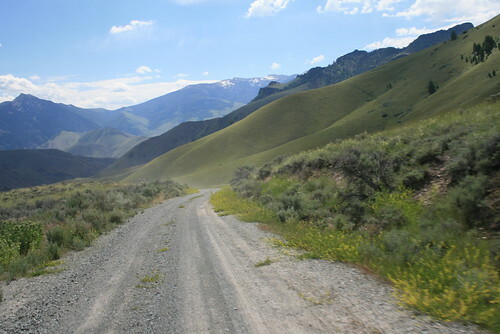 After having lunch, we continued up the road to the town of Challis, ID. What a nice town! It is in a valley surrounded by huge mountains on three sides. We stopped there for gas and some oil and bolts for the bajas at Napa Auto Parts. 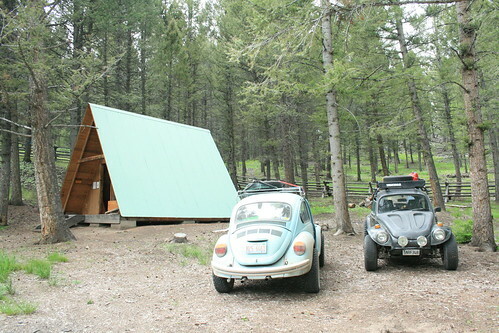 But what we were really excited about was that now we were only about 25 miles away from the Peel Tree A-frame cabin we rented from the Salmon-Challis National Forest for the next two nights. 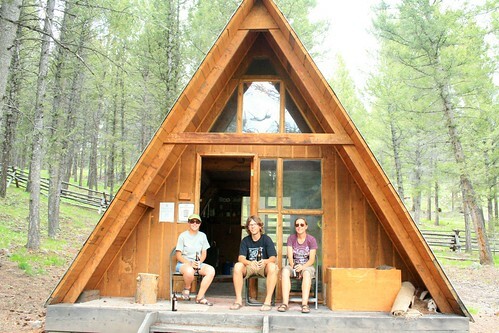 Idaho has a bunch of A-frames that are available to rent from the local ranger stations for really cheap. They have no running water or electricity. They are really off grid in the middle of the woods halfway up a mountain side and usually require a high clearance vehicle to get to because of the dirt forest roads that you have to drive down to get to them. 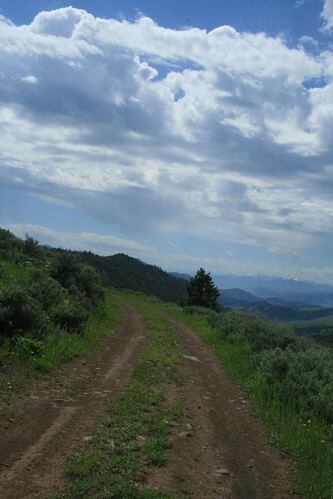 Some of them aren’t even accessible by a car; only by foot, horse, snowmobile, or ATV. 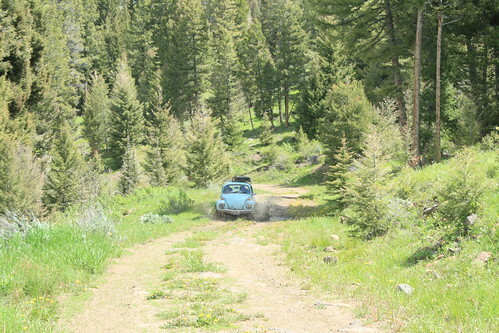 We were lucky that this one was down a dirt road that was well maintained. We turned off of Hwy 93 onto one of the only bridges that crosses the Salmon River in that area, onto Iron Creek Rd. Then we started climbing crazy switchbacks up into the mountains and into a pine forest. After about 6 miles or so of driving up the back roads, we found the A-frame cabin. We were so excited to be there! For me, there is just something really cool about living in a cabin in the middle of the mountains in a pine forest with nothing but wilderness surrounding you. We quickly settled in and explored the small cabin. There was an upstairs loft which had 4 mattresses on the floor where we were to sleep at night. You had to climb up to the loft on a ladder and enter through a hole in the ceiling. The downstairs room had two more beds and a wood burning stove for heat, and a table. There was also a huge ax for splitting wood outside. The outside of the cabin was all roof. There was also a picnic table outside next to a fire pit. That evening we had a fire outside and ate some cheese and broccoli soup. Then we moved the fire inside into the wood burning stove to heat up the inside of the cabin at night. The loft was all dark upstairs and I was kind of scared to go up there first when we got tired enough to go to sleep. Some people left huge thick candles in the cabin, so we lit them and had light in the loft. Then we blew them out when we went to sleep. The Peel Tree A-Frame, enjoying a beer. 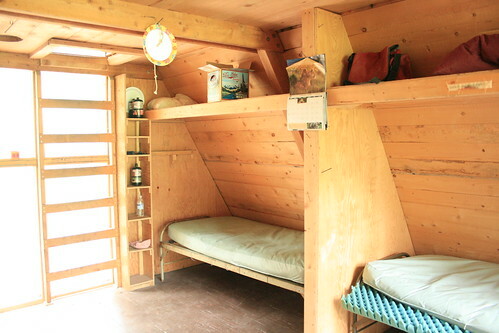 Two beds inside the A-Frame in the main room. The two bajas parked outside of the cabin. The next morning we had plans on exploring the mountains around us via the forest roads. So after having breakfast we hopped into the bajas and hit the dirt roads. We saw on the map one road wound up a mountain and at the top was Sheephorn Fire Lookout Tower. It was an old tower that was used to look out for wild fires but now is rented out to the public to spend a few nights in, like the A-frame cabin. The road was pretty steep and we had to climb in 1st gear but we finally made it up to the tower which was at almost 9,000 ft. But Nicole and Marcel we lagging behind and we lost them from our view. Romy and I climbed the tower (nobody was there) but we still didn’t see N&M. The surrounding mountains were really high still covered in snow. They surrounded us 360 degrees! Driving along the national forest road to see the fire lookout tower. 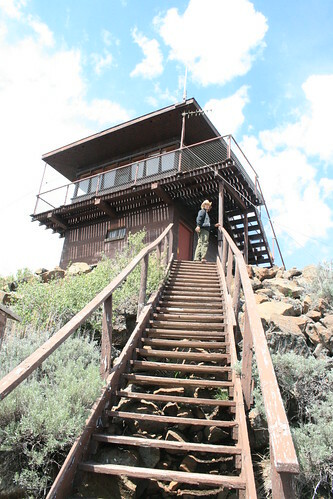 Sheephorn Lookout Tower at 8,159 feet. Nicole and Marcel are splashing around in the mud! Finally we saw N&M walking up the dirt road to the tower. When they got to the tower they told us that their baja just wouldn’t go into gear anymore. It wouldn’t drive forward! So after taking in the views on the top of the mountain at the look out, we walked down to see what the problem might be. Up high on the side of the mountain, we tried putting their baja into gear, which it was able to do, but it seemed as if the engine was not connected to the transmission anymore. Luckily we were at the highest point of the drive, which meant they could basically roll the whole way down. Well, mostly the whole way down. Unfortunately there were patches of the road that went up! Good thing we had a tow strap. The plan was to get the two bajas back to the cabin, which was by now 10 miles or so away. Hooking up N&M's baja to our rear bumper with a tow strap to tow them back to the cabin. We started the slow journey back to the cabin, our fun exploring time cut prematurely short with a breakdown! We figured it was an issue with the pressure plate, related to the clutch. Romy also suspected it might be a broken CV joint but the boot looked just fine. So N&M started rolling down the mountain and when there were stretches of uphill or long patches where the road was pretty level, we connected N&M’s baja to our rear bumper via the tow strap and pulled them along. Our carb was still screwed up so we didn’t have as much power as we normally would have, plus we were at elevation, so we were afraid we wouldn’t be able to tow them, however, Romy switched transmissions to a bus trans just before we left Cali, which has better gearing. 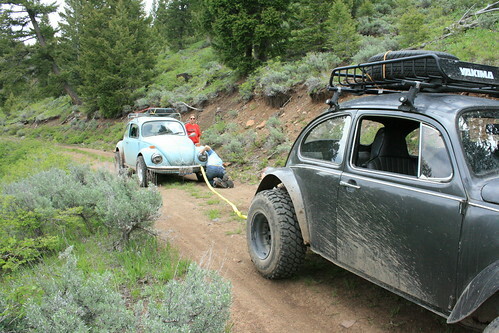 It turned out that the way it was geared was also good for towing so we were able to pull them all the way back to the cabin without very much issue. Romy and Marcel working on dropping the engine in N&M's baja to investigate the cluth and pressure plate. 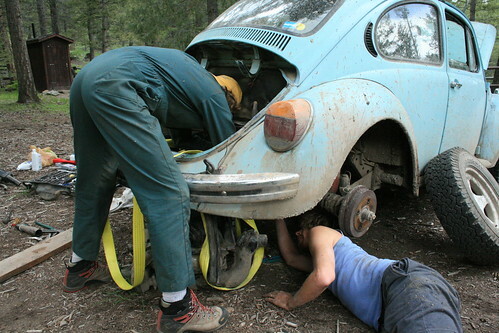 When we made it back to the cabin, we decided to drop the engine to get a look at the clutch and pressure plate. We figured that was most likely the problem, not the transmission since it was still shifting fine. So after jacking up the baja and letting it sit up high on two fat stumps of a tree (hey you gotta improvise for jack stands somehow) we got the engine off and on the ground. And guess what – the clutch and pressure plate were looking completely normal. Nothing was broken. We were pretty happy with that but it still had us wondering what the heck was wrong!? We had the back tires off for ease when we dropped the engine which made the axles and CV joints in plain view. The next possibility was to check them to see if they were broken somehow. So we spun the wheels and to our shock, the axle spun but the CV joint and boot didn’t on the transmission end! OMG their CV joint or axle busted! I was actually really excited because I didn’t know what a broken CV joint would look like. I think CV joints are the coolest part of a car because of how they can turn and rotate at the same time with such high speeds. If it broke, it must be a huge explosion, but the boot looked clean and normal. So we unbolted the CV joint, and looked inside. To our amazement, it was completely normal and NOT broken. But we noticed that it could turn while it was connected to the axle and that it backed itself out. And that the circlip was missing. Well, we found the circlip sticking to the transmission hidden under a gob of grease, so it must of fallen off and allowed the CV joint to back off the axle. Then the splines of the axle that hold the CV joint in place sheared and it started rotating, which basically disconnected the rotation of the transmission to the wheels. Since the transmission will preferentially spin the wheel with least resistance, it was spinning the one with the sheared splines and the baja would not move forward. Amazingly, the CV joint backed out almost the entire amount it could of, so little of the splines on the axle were damaged. In fact, all we did was take a metal file and filed the splines back. Then it was as ‘simple’ as putting the CV joint back together and hammering it back onto the axle and putting the circlip back on. We sure hoped that the problem was now fixed and that it wouldn’t back out again for some reason. But of course, we still had to put the engine back in . . . which took forever for some reason! Long story short, we were able to put the car back together and the problem was no more!!! The road back to the highway from where we stayed in the cabin. So our cabin stay was excellent. Great views, quiet, adventurous, and it had a happy ending. When we drove out of there the next morning, both under our own power, I was really sad to leave. I want to build my own A-frame one day. They have very simple designs (the engineer in me made sure to draw up blueprints of the cabin before we left). 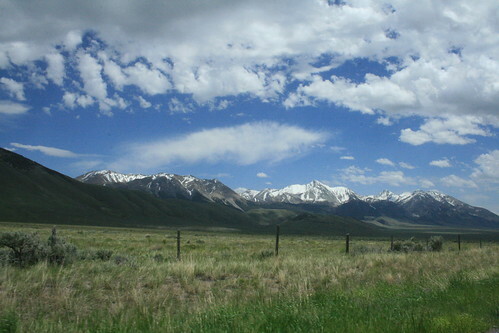 Next we were headed into Montana to check out Big Hole National Battlefield. Nice adventure. Actually, on a volkswagen beetle, one wheel drives forward and the other wheel drives in reverse. The wheel hubs strip out on occasion, as yours did. If you would have switched back wheels then forward would have worked and not reverse, since the good wheel would have been on the forward axle.